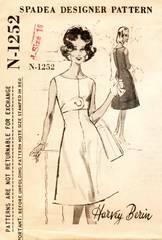 Chic, sleeveless dress pattern designed by Harvey Berin. "In this sleeveless, one-piece model, a charming make-believe bolero attached at the sides underscores the high bosom. The back view reveals one sliding curve from the delicately widened shoulders to a correspinding flare at the hem. To maintain its crisp A-line silhouette we suggest lining the dress." Size 16; Bust 38; Waist 28; Hip 39. Pattern is used and complete. Comes with original mailing envelope postmarked 1963.